A Very good morning lovelies..ths sun has got it hat on hip hip hooray......but for how long??? im of to the hospital this morning so as one never can tell how long one sits around waiting or how boring it is flicking through the mags that have be there for years picked up a mag last time called *period property* that looks ok...opened it up and it was all about periods...ladies you know or have known and all the ruddy accessories you can get..wtf!!!! i thought it was going to be a mag on country estates....er wrong!!!! i looked around and no one was looking i discarded it on the mans chair next to me whod popped of for a cuppa....i just hoped id have been called by the time he returned...thank god or the blood nurse i was .so i thought it upload my latest crazy creation before i go lol!! !oh before i forget i was featured inhttp://dezinaworld.blogspot.co.uk/2012/05/your-creations-to-feature.html ..how special is that ...sooo fabby a million thanks for choosing me and two other very talented ladies thanks hunnie..
i have had this poor tilda on my desk for days and just didnt know what to do with her..shes become my special friend.. id try and chat ..you know pass the time of morning with her....**what we gonna do today tilda**....she never says much ..anyway it was her turn last night to be conjoured up in her own setting..not quite sure in which direction i was going so added my tim holtz cage with bird(dont suppose she talk to him either..) coloured with re inkers in weathered wood tilda that is and her face is a little washed out as i go and put a rosey glow...and she suddenly turns into a female version of David Dickinson...for those not familiar..hes the one on tele with a orangey fake tan....lol!!! so matted her with papers from tim holtz an ddistress the edges i meant to stich but i got carried away...used some of my new LUSH lace from my HRH lady Allessandra..(shell understand this secret code lol!!! )she one great person...the ace colour went well with her frock i found this ribbon and flowers on my last disaster dilemia in **sassys going to hobbiecraft** NOT hollywood.....so not bad colour match considering i had'nt stashed my new friend in my bag ...i did a little stmaping of a butterfly..used some little tags( i see these around but dont know where to buy them) so i bought these from staples edged them and printed hugs it looks like IUGS because the bows hiding..i distressed every thing.i also have seen of late these lush out the page borders ..now sassy hasnt got much in the way of dies..and the only one i had was this sizzix so chopped it in half and used it under the card..added a tag...and of course the bows.oh and i coloured some tulle in weathered wood mix..so it blended nicely not a deep colour but took away the ivory went nicer with my ribbon so know i have a big glass full of weathered wood..i need to use up so i guess your gonna be seeing a few creations all in weathered wood for the next week or so ..LOL!!! !..Anyway i really hope you might like it ...many thanks for the most wonderful comments of late..it really makes me feel special..so a mamooose sassy hug to each and every one..consider yourself well hugged today....mwah!!!! Hope the hospital appointment goes ok - you made me laugh about the magazine. I would have thought the same. an that lace is defo yummy, you always have the best taste in embellies..stunning creation. that is absolutely gorgeous, love all the details! Beautiful card Sassy, I like the sweet Tilda and all the embellishments. Woww this is just gorgeous and Tilda is so adorable!!! Tilda is so cute and your colouring is fantastic. Wow! this is gorgeous Sassy! 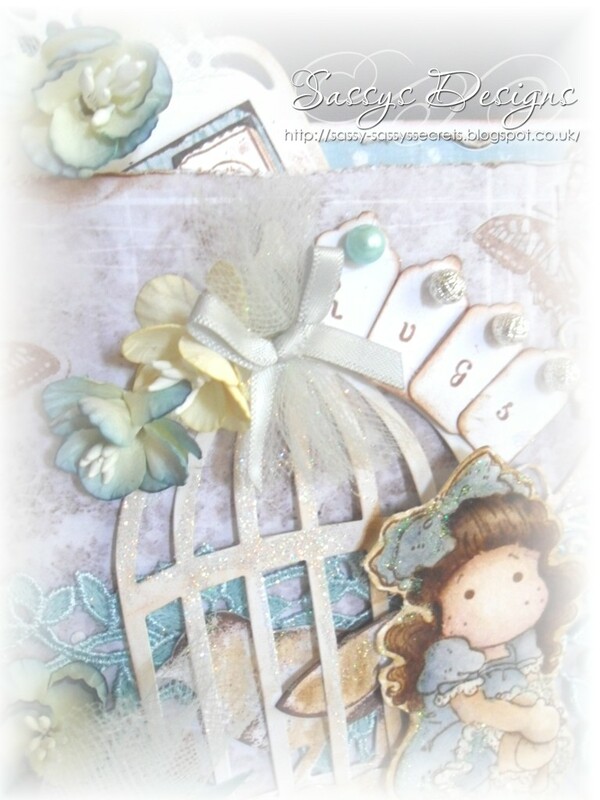 I love the Tilda image and the die cuts and papers are all SO beautiful. It's an awesome card! 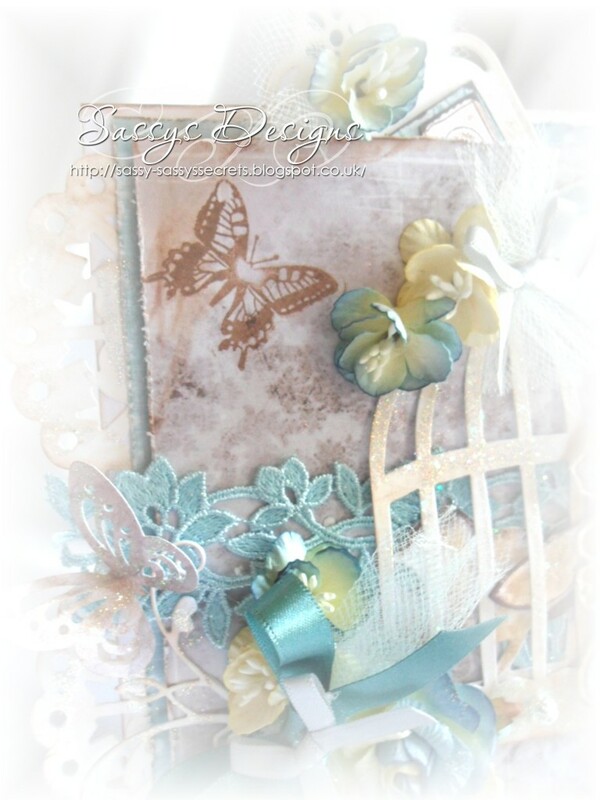 Gorgeous card, love your color choices, so soft and shabby. Enjoy reading your blog, you're so funny, you make me laugh every time. 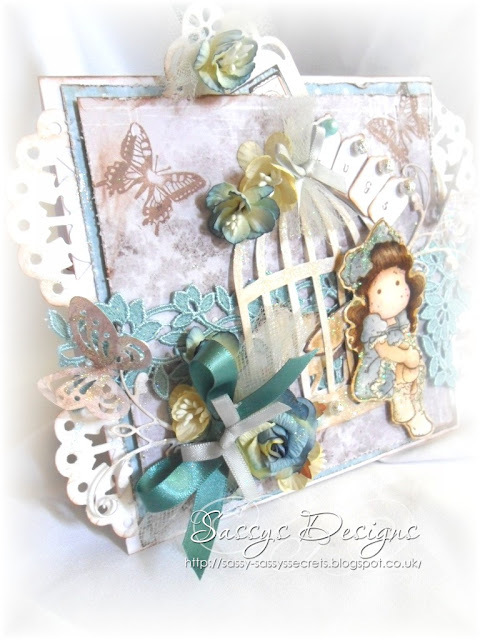 Another gorgeous creation, so soft and gentle.